There’s always trepedation when you hear that a play is an ‘undiscovered gem’ by a playwright that has been ‘almost lost to history’. It sounds shorthand for describing a not very good play by a third-rate playwright whose work has been quickly buried. But, in the case of Mary Pix’s The Fantastic Follies of Mrs Rich, it really is true. 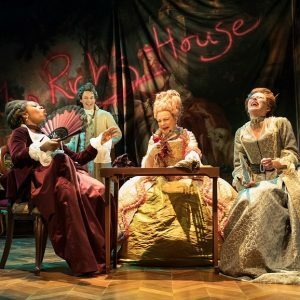 This charming, funny, splendidly staged Restoration comedy, created by a woman lost in the annals of time, has waited far too long for a revival. 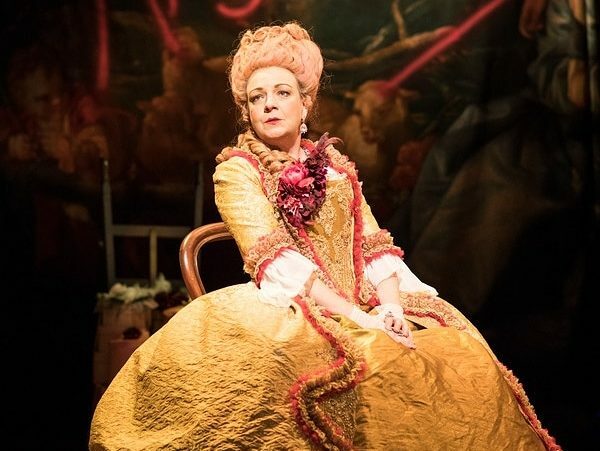 Dusted off and spruced up, the colourful Mrs Rich is now delighting audiences in the RSC Swan Theatre, Stratford-Upon-Avon. It’s the perfect antidote to the dark and bloody Macbeth being played out in the company’s main theatre. 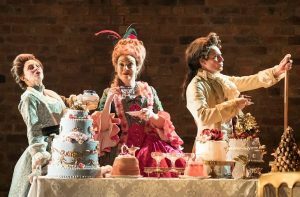 Part comedy of manners and part morality tale Mrs Rich satirises social climbing and high society of the 1700s yet wouldn’t look out of place in today’s venal and materialistic climate. Class was a dirty word then as it is now yet many still aspire to it, some are born with it while others try hard to disguise it. Former EastEnders’ actress Sophie Stanton has a ball being elevated from downmarket Albert Square to the beau monde of Covent Garden, for the plum part of banker’s widow, Mrs Rich. Mrs R has been left ridiculously well off. But all her thousands can’t buy class (or a stylish dressmaker). She yearns to be accepted at court and move in the highest echelons of society. Yet all her plotting can’t land her a title or loyal friends. All she has are card-shark Mrs Trickwell and the snobbish Lady La Basset who visit daily to relieve their guest of her purse and pass on gossip. Mrs Rich is determined to land the foppish booby – and rake about town – Sir John Roverhead who, although impoverished, nevertheless has the right social connections and all important title. Meanwhile her unwelcome, young, house-guest, the fragrant Lady Landsworth, also a widow, has fallen in love with a stranger she met at the theatre and hatches her own plot to discover his identity and wed him. However, nothing is straightforward. The libertine Sir John flits from one wealthy woman to another, intent on spending their dowries before moving off; the servants fail miserably at match-making and a succession of minor characters muddy the romantic waters still further. Michael Simpkins, as Mrs Rich’s brother-in-law, tries to be the voice of reason but his cautionary warnings are rebutted by the determined widow. Solomon Israel plays the principled and lovesick object of Lady Landsworth’s affection, who is on his uppers after missing out on an inheritance. He has moping down to a fine art. The older brother (played by Leo Wringer), who Pix doesn’t even give a first name, is the hunting, shooting sort and, as such – but perhaps for no other reason than it’s a real crowd-pleaser – he brings his dogs on stage. I’m with Elizabeth I on this one. She demanded, so it is said, that Shakespeare always include a dog in the productions she was to see because she loved them so. Deerhound Theia and lurcher Lossie loped on stage last night and stole everyone’s hearts. The ladies in the front row reached out to pet them, they were concerned when a sudden gunshot caused Theia to bow her head and tuck in her fluffy, grey, tail, and they were delighted when Lossie kept jumping up for treats hidden in the costume of actress and on-stage handler Amanda Hadingue. The impeccable pair also got a round of applause when they trotted off. 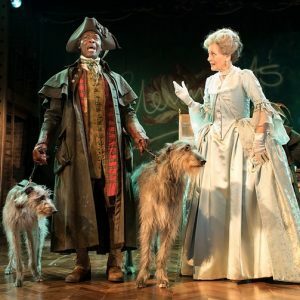 Dogs aside – and it is difficult to tear yourself away (they even upstaged Mrs Rich in the grand finale) – this hilarious production is a riot of colour and exuberance. 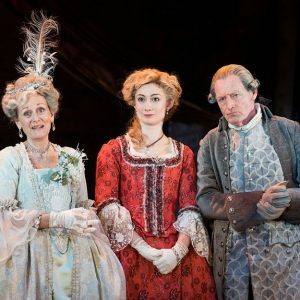 The costume department has broken out the periwigs, frockcoats and embroidered silk stockings for Tam Williams‘ entertaining and dissolute philanderer, Sir John, while the women are a kaleidoscope of fine frippery. At times Stanton’s outlandish frocks could double for the wardrobe of a pantomime dame but they are glorious concoctions, from the extravagant hats to the sumptuous gowns. Sandy Foster is pure Patsy as Mrs Trickwell, her face screwed up alarmingly as though frequently encountering a bad smell on stage. 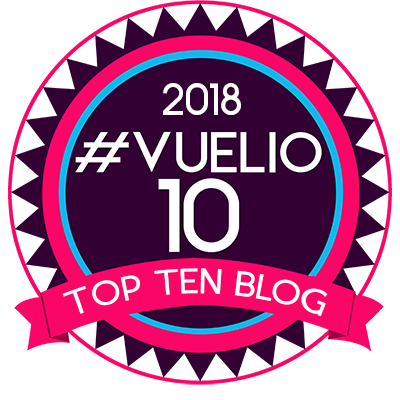 She makes an Ab Fab double act with Stanton’s occasionally flawed and deluded widow as the pair cut a dash through society. Will Brown and Laura Elsworthy provide strong support as cheeky servants along with Sadie Shimmin’s entertaining landlady, Mrs Fidget. But it is Sophie Stanton’s powerful and radiant turn in the title role which dominates Jo Davis’s scintillating and uproariously funny production. The Fantastic Follies of Mrs Rich plays in the Swan Theatre until June 14. Buy The Fantastic Follies of Mrs Rich theatre tickets from one of our recommended theatre ticket websites. Uproariously funny, mischievous and entertaining, Sophie Stanton is terrific as social climbing widow, with more money than sense, Mrs Rich, in this forgotten comic masterpiece.